Pigeon pea (Cajanus cajan), an important legume crop is predominantly cultivated in tropical and subtropical regions of Asia and Africa. 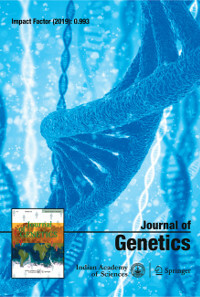 It is normally considered to have a low degree of genetic diversity, an impediment in undertaking crop improvement programmes.We have analysed genetic polymorphism of domesticated pigeon pea germplasm (47 accessions) across the world using earlier characterized panzee retrotransposon-based molecularmarkers. Itwas conjectured that since retrotransposons are interspersed throughout the genome, retroelements-based markers would be able to uncover polymorphism possibly inherent in the diversity of retroelement sequences. Two PCR-based techniques, sequence-specific amplified polymorphism (SSAP) and retrotransposon microsatellite amplified polymorphism (REMAP) were utilized for the analyses.We show that a considerable degree of polymorphism could be detected using these techniques. Three primer combinations in SSAP generated 297 amplified products across 47 accessionswith an average of 99 amplicons per assay. Degree of polymorphism varied from 84–95%. In the REMAP assays, the number of amplicons was much less but up to 73% polymorphism could be detected. On the basis of similarity coefficients, dendrograms were constructed. The results demonstrate that the retrotransposon-based markers could serve as a better alternative for the assessment of genetic diversity in crops with apparent low genetic base.